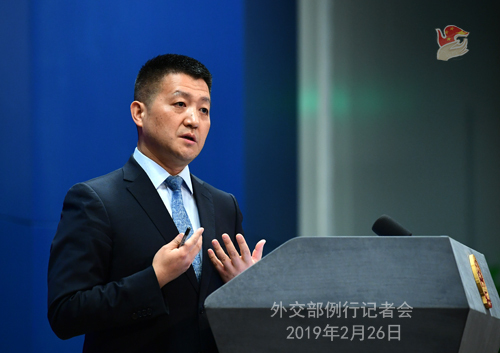 At the invitation of State Councilor and Foreign Minister Wang Yi, Diplomatic Adviser to the President of France Philippe Étienne will pay a working visit to China from February 28 to March 2. Q: Iranian Foreign Minister Mohammad Javad Zarif announced his decision to resign today. What is the Foreign Ministry's response to this? It was only last week that Zarif wrapped up his visit to China. Is the Chinese side worried about the future of the Iranian nuclear deal? A: The Chinese side noted relevant reports. Over the past five years or so, as the Iranian Foreign Minister Mr. Mohammad Javad Zarif has made positive contributions to the development of China-Iran relations. The Chinese side appreciates this. China and Iran are comprehensive strategic partners, and we stand ready to work with Iran to advance our comprehensive strategic partnership. Regarding the JCPOA you mentioned, I believe you are aware of China's position. We always believe that the JCPOA must be upheld, and we are making our best efforts along with relevant parties, including Russia, to uphold the validity of the deal. We believe this is conducive to the peace and stability in the Middle East and the international nuclear non-proliferation system, and serves the shared interests of the international community. Q: According to reports, DPRK leader Kim Jong Un has just arrived in Viet Nam. Photographs of his train show that it was a Chinese train that was pulling his carriages, which appears to be a different train that he was using when he crossed over the border in Dandong. Can you confirm that the Chinese government did provide the use or at least the front part of the train-the locomotive part of the train-to help the train of Chairman Kim get to Viet Nam? A: I am not that attentive to these details as you are. I wonder if the change of locomotive would in any significant way affect your analysis on the situation? What I can tell you is that upon consultation, the Chinese side provided transport support to Chairman Kim during his transit in China, who was heading for the second DPRK-US summit in Viet Nam in a special train. Q: We noted that the Chinese side issued a brief news release after the China-US trade talks concluded last weekend. Could you offer more details about the outcomes of this round of trade talks? US President Trump said that if the talks with China go along very well, he will be meeting with President Xi Jinping at Mar-a-Lago. What's your comment? A: The Chinese side issued some information about the outcomes of the trade consultations, which I believe is stated in a fairly clear way. You may also be aware that the consultations are still underway. As I understand, it would not be appropriate to make the details public yet. As you can see from what was released by the Chinese and the US sides, in this 7th round of high-level consultations, the two teams have followed the important consensus reached by the leaders of the two countries during their meeting in Argentina and made new progress building on what was achieved earlier. The two sides also said that they would continue to follow the consensus and instructions of the two leaders to achieve a mutually beneficial and win-win outcome for both sides at an early date. You observed that President Trump said if the talks with China go along very well, he will be meeting President Xi Jinping at Mar-a-Lago. Like we said, we noted that President Trump said on many occasions recently that he is looking forward to meeting with President Xi Jinping again. President Xi also said in his message to President Trump that he will maintain close contact with President Trump through various means. I believe the working teams of the two sides will make full preparations for the relevant matters of the summit between the two leaders. Q: CEO Nick Read of the British company Vodafone, the world's second-largest mobile operator, said at the Mobile World Congress that excluding Huawei would delay Europe's 5G rollout by probably two years. He added that if companies are forced to swap their Huawei equipment, it would wreak havoc on national infrastructure and incur high costs for consumers. "People are saying things at the moment that are not grounded," said Read, " I have not met the US side directly myself so I have not seen what evidence they have, but they clearly need to present that evidence to the right bodies throughout Europe". Do you believe that his remarks will be beneficial to Huawei? A: I have noted relevant reports. As you can see in the reports, Huawei is having professional dialogues with the governments, industries and companies of relevant countries at the Mobile World Congress in Barcelona. I believe that what the CEO of Vodafone said is reasonable. These "people" he mentioned have failed to provide any evidence on which their allegations are grounded, which is the key point. In fact, these same people have been leaving no stones unturned and even using state power to suppress other countries' companies and curtail the normal and mutually beneficial cooperation between them in order to serve their own interests. However, these people need to know that companies and consumers of other countries make decisions that favor their own interests. As the Vodafone CEO said, policies need to be rolled out based on facts instead of fabricated lies. As I noted, a commentary in the Financial Times yesterday stated that thousands of cyber attacks take place every day around the world, but there is no evidence to prove that Huawei is behind even one of them. 5G technology is born out of exchange and cooperation among all countries amid globalization. It is the product of hi-tech innovation shared by the international community. We believe that it serves the fundamental interests of all parties to uphold multilateral cooperation for win-win outcomes, foster an open and inclusive business environment, and safeguard the international rules that are fair, just and non-discriminatory. We also believe that all countries will make the right choice independently that meets both their interests and the trend of the times. Q: According to reports, 87% of the voters supported the reforms to the constitution of Cuba in a referendum. Does China have any comment on that? A: The high supporting rate of the new constitution in Cuba symbolizes important progress in the country's constitutional reform. China congratulates Cuba on this result. The new constitution bears great significance to Cuba as it will lay out the legal framework for Cuba's future development. We respect and support the Cuban people's choice, and wish and believe that Cuba will enjoy broader prospects of development. Q: The DPRK leader Kim Jong Un is in Viet Nam for his summit with Donald Trump. Does China have any plan to organize a visit here in China for the DPRK leader right after the summit? A: China and the DPRK share a tradition of exchange of high-level visits. We will timely release the information if we have any. Q: Two US warships yesterday sailed through the Taiwan Strait, which I believe is something like the fourth or fifth mission by US warships through the Taiwan Strait in the last couple of months. Has China complained to the United States about this latest sailing? A: The Chinese side has made clear its position many times and expressed its concerns to the US side. 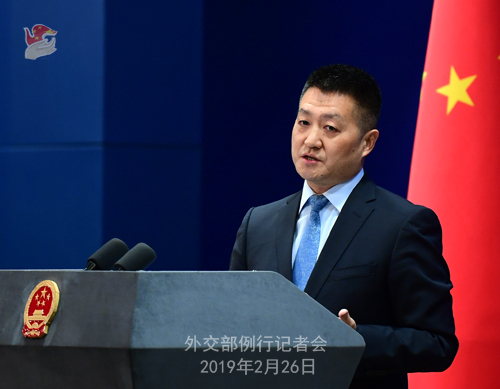 We are firmly opposed to these provocative actions by the US side which are not conducive to the peace and stability in the Taiwan Strait as well as the China-US relations. Q: According to reports, the Indian air force today carried out some air strikes against terrorist forces inside Pakistan across the Line of Control. What is China's reaction to that? India is saying that this is a non-military attack because it was carried out not against the military but against the terrorist forces who had attacked India and killed Indian soldiers. What's your comment? A: India and Pakistan are both important countries in South Asia. A harmonious relationship between the two are crucial to regional peace, stability and development and serves the interests of India and Pakistan fundamentally. We hope the two sides will exercise restraint and take actions that will help stabilize situation in the region and improve bilateral relations instead of doing the opposite. You mentioned that India said their operation was against terrorist forces. I would like to point out that terrorism is a global challenge that calls for cooperation between countries so as to create enabling conditions and a favorable atmosphere for necessary international cooperation. Q: The second summit between the DPRK and the US leaders will soon be held in Hanoi. What expectations does China have for this meeting? What kind of role will China play between the DPRK and the US during this meeting? What is China's comment on Vietnam's efforts and role in hosting this meeting? 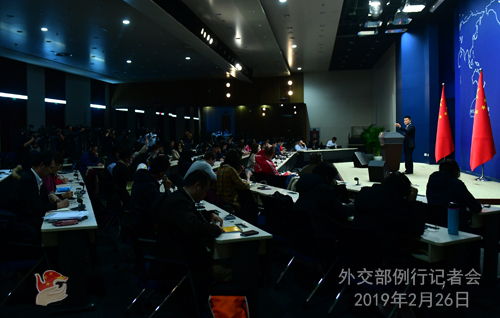 A: As you know, China's proposition on the Korean Peninsula issue mainly comprises two aspects: first, to realize the denuclearization of the Korean Peninsula; second, to achieve and maintain the lasting peace and stability on the Peninsula and then in Northeast Asia. To achieve these two goals, we believe that the DPRK and the US, as the key parties concerned, should take effective measures, fully consider and accommodate each other's legitimate concerns, and work for the shared goal of realizing denuclearization and lasting peace of the Peninsula on the basis of mutual respect. We are pleased to see that the situation is developing in the direction that China has advocated and hoped for. This is the role that China has always played and will continue to play. The second meeting between the DPRK and the US leaders is going to be held in Hanoi. It is not only the Chinese side, but also actually all parties in the international community, that hope the DPRK and the US will continue to make substantial steps towards realizing the denuclearization, peace and stability on the Peninsula. We hope that the meeting to be held in Hanoi will be successful. From the reports we could see that the government and people of Viet Nam have made thoughtful preparations for this meeting. We hope that the outcomes of the meeting will be worthy of such preparations. Q: On the DPRK-US summit, you just mentioned that when Chairman Kim Jong Un passed across China, the Chinese side took measures to guarantee his security? A: I said transport support. Q: Yes, transport, sorry. So during the trip, for example in Tianjin, have Chinese leaders had any contact with Chairman Kim? Second, after the summit in Hanoi, will the DPRK leader still travel past China and will the Chinese side provide transport support again? A: Your first question was actually raised earlier by another journalist. China and the DPRK share a tradition of exchange of high-level visits. If there is any information to be released, we will release it in a timely manner, as I know you are all following this very closely. As for the means of transport for Chairman Kim's return, I believe you know that it is not appropriate for China to release information regarding itinerary of other countries' leaders. Q: It has been reported that the Sudanese President Omar Al-Bashir declared a one-year national state of emergency on February 22. He dissolved the central and state governments, asked the National Assembly to postpone constitutional amendments and called on the opposition party to stop organizing demonstrations and protests and step up political dialogue with the government. He also pledged to undertake economic reforms. What's your comment? A: We support the Sudanese government's efforts and measures to maintain national stability and restore social order. Stability in Sudan not only serves the fundamental interests of its people, but is also conducive to peace and tranquility in the region. China has provided a batch of emergency food assistance to Sudan and will continue to offer assistance within its capabilities to the Sudanese people as such need arises. Q: Yesterday the Pakistani Foreign Minister Shah Mahmood Qureshi made a telephone call to the Chinese State Councilor and Foreign Minister Wang Yi and briefed him about the latest situation in the region in wake of the attack in Indian-held Kashmir. Do you have more information to share with us? A: As you said, yesterday State Councilor and Foreign Minister Wang Yi had a telephone conversation with Foreign Minister Shah Mehmood Qureshi at request. You may have noticed that State Councilor and Foreign Minister Wang Yi listened carefully to Foreign Minister Qureshi's briefing on the relevant situation and the propositions of the Pakistani side. He also reiterated that China supports the Pakistani and Indian sides in properly resolving the issue through dialogue as soon as possible to avoid the escalation of tensions. We also hope that Pakistan and India can jointly advance counter-terrorism cooperation and safeguard peace, tranquility and stability in South Asia. Q: About the DPRK-related sanctions, last week China said that the Security Council needs to consider holding a debate on invoking the provisions of Security Council resolutions, which would at least take a concession from the US. Do you have any suggestions about what concessions might be made on either side to make the negotiations move forward as the DPRK-US summit is to be held in days? A: Like I just said, progress needs to be made in the negotiations between the DPRK and the United States, and the key is that both sides should carefully listen to, consider and accommodate each other's legitimate concerns and meet each other half way. As the Chinese side said, the general direction should be both promoting the denuclearization of the Korean Peninsula and replacing the armistice with a peace regime in parallel. We believe that under the current circumstances, as various members of the international community are calling for, if some positive measures are taken, such as easing or even lifting part of the sanctions against the DPRK, it will surely be conducive to this process. As for what kind of concessions the DPRK and the US should make respectively, it depends on the talks between the DPRK and the US, and the Chinese side cannot get ahead of that. But we believe that the two sides should follow the general direction of mutual respect and accommodation of each other's legitimate concerns.